We started this day with a location talk of the international boarder held at the Gachado Line Camp. This talk was led by Ranger Scott who had been the night sky ranger we had for a presentation the evening before. 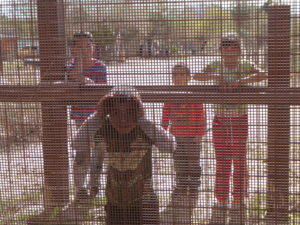 We went by van almost into Mexico again and stood and talked about history and complexity of the border issues. We got to see a small adobe line camp that the Gray brothers used during their ranching operation. We saw the pedestrian fence close up on this trip. It is 16’ high and very strong and would be hard to cut through. The vehicle fence is still behind the pedestrian fence. 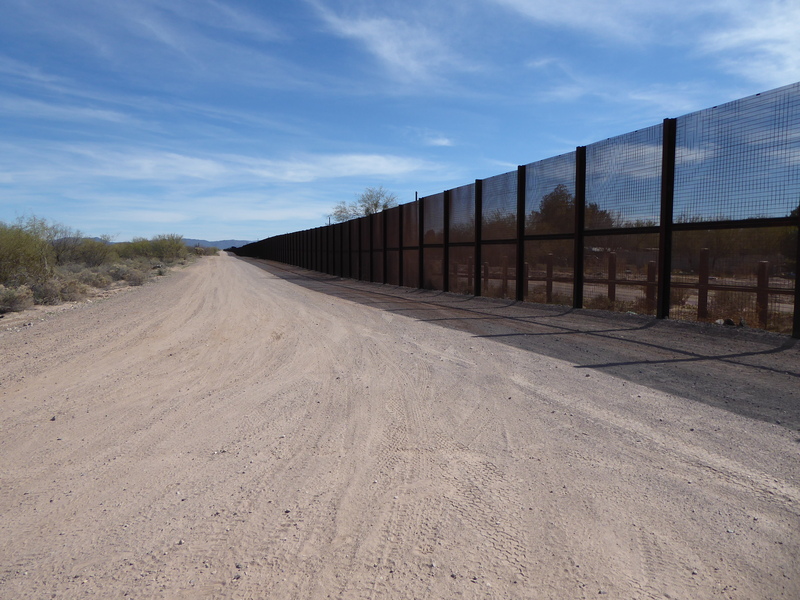 We stood by the fence talking for quite some time and Mexican families were living their daily lives – driving by, kids out playing, perhaps watching TV since there were satellite dishes on most of the roofs. 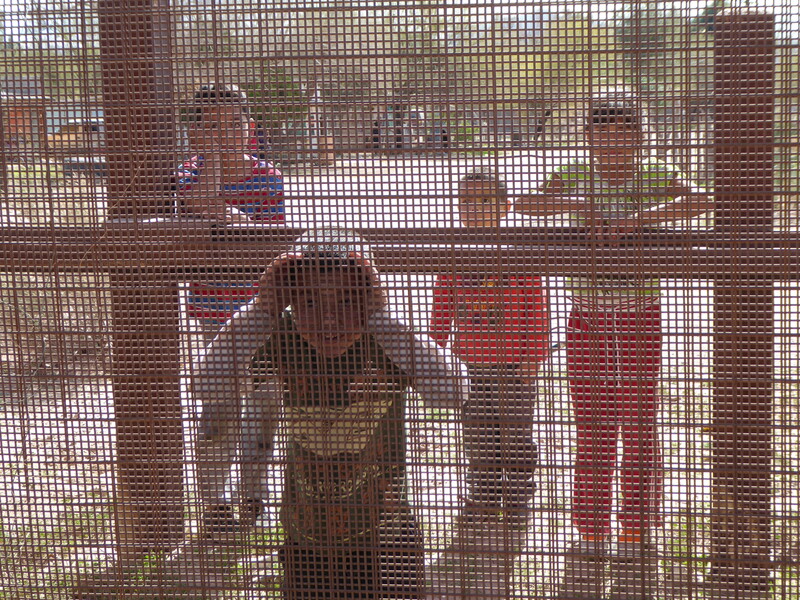 After a while, 4 younger children came close to the fence and finally one boy put his face right up to it. One lady in our group talked to the kids and they ranged in age from 3 – 7. The fence brought up lots of discussions and we were glad we got to see it. There is a very strong border patrol presence in and around the park and all of the highways we have used to get to southern Arizona. 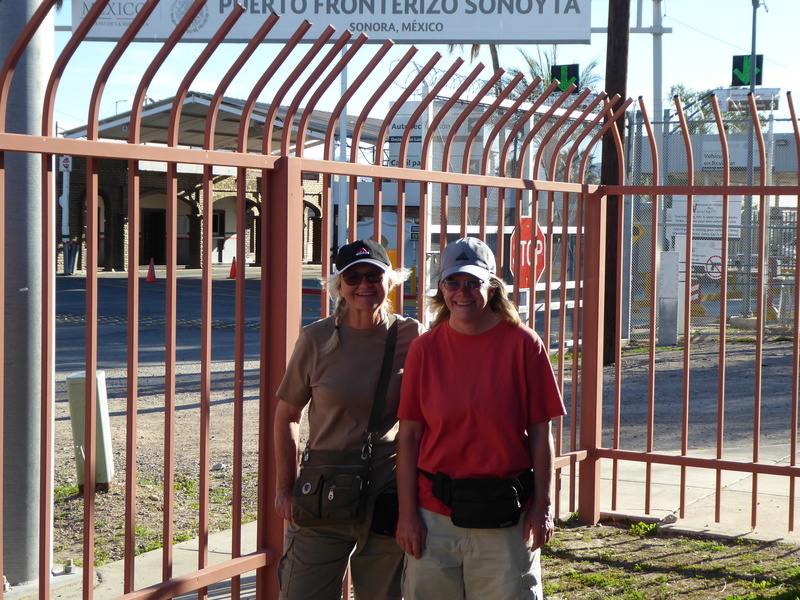 We have gone through numerous checkpoints, sometimes over 60 miles from the border. One evening a few of us drove down to Lukeville, US which is right on the border to see what was there. There was a post office, liquor store, gas station and convenience store. 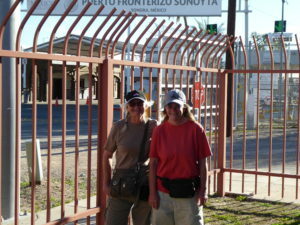 We got a picture of the entrance gate into Sonoyta, Sonora, Mexico. We signed up to take a van ride out into the desert so that we could hike back to the campground. The van was full – 11 people were dropped off to go hiking! There were multiple trails of varying lengths that could be combined to get back to the campground. Two of our RVing Women friends signed up to go with us. 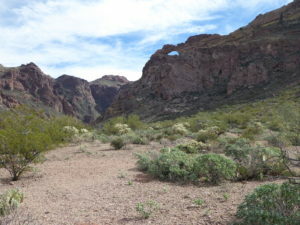 We hiked 5.2 miles because we did a spur trail to see the ruins of the Victoria mine. On the hike we got to see a lot of interesting landscapes and intricate pieces of the desert. 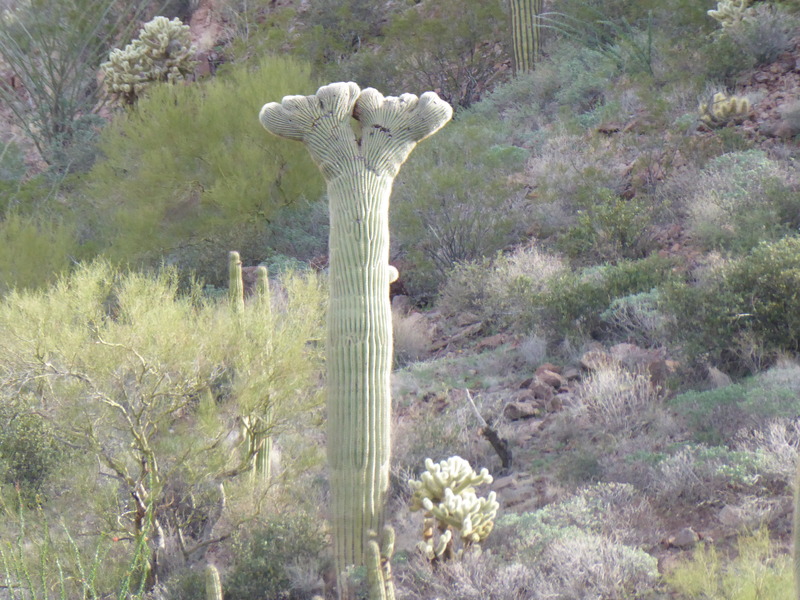 Columnar cacti have their strength supporting structures, their bones, on the inside. You don’t see that until they die. 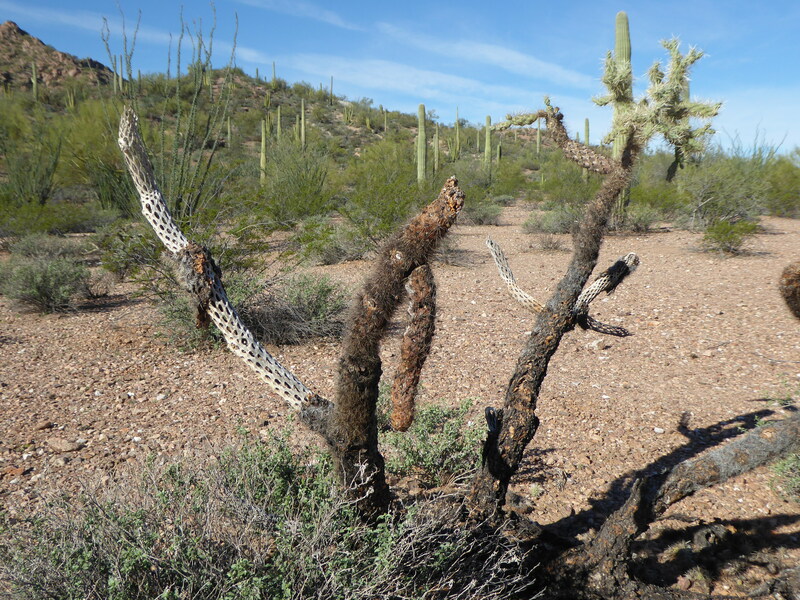 When a cactus dies, you then see the woody remains; they almost look like a tree. 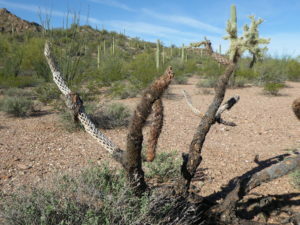 We actually had some great camp fires at Painted Rocks BLM using these cacti remains that we gathered up. Here is a picture of Vicki, Sandy and Kathy hiking. We saw a large hawks nest in a saguaro cactus. 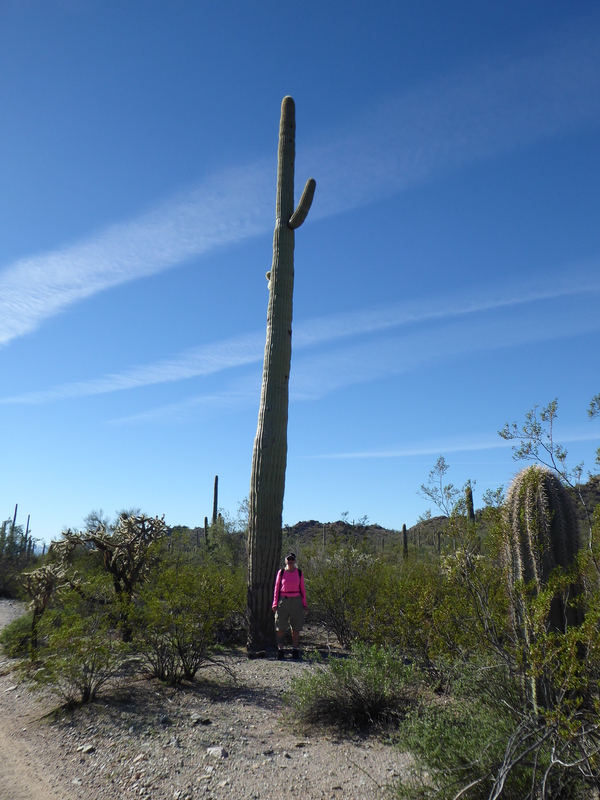 The hawk was not in the nest but we did see a few hawks sitting on top of saguaro during our visit to Organ Pipe NM. 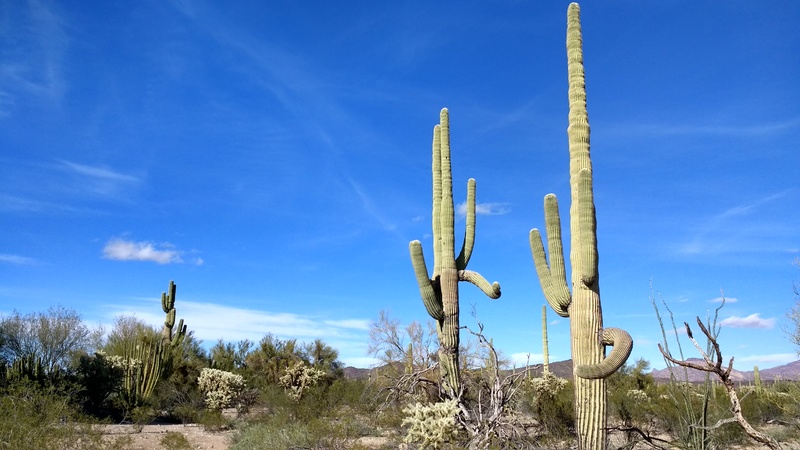 During one presentation, we learned that it takes a while for them to learn how to land on top of the saguaros, but they can pull the sharp spines out quite easily! Ouch! 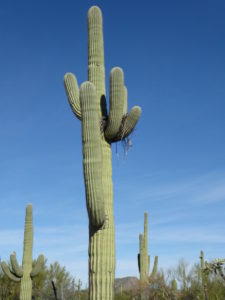 The saguaros can grow to be quite tall and grow 3 – 4” per year in this area. They don’t get arms until ~ 90 years old and can get numerous arms. The arms can point downwards in times of drought and then can grow back up when they get water again. 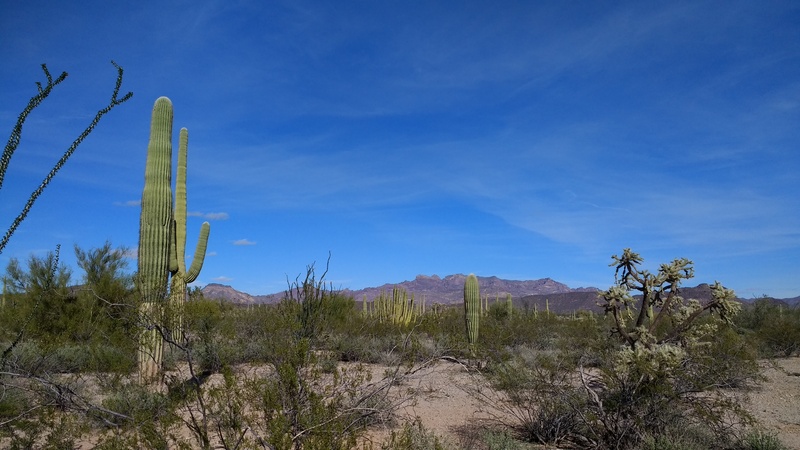 When we first entered the Organ Pipe NM we thought it should be named Saguaro NM – you don’t really see any Organ Pipe cactus until about 15 miles into the park. 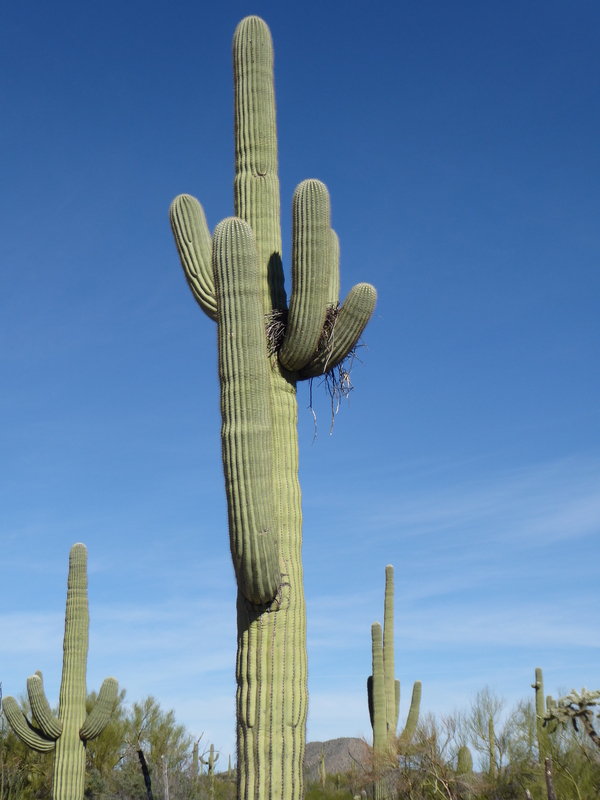 As an average Saguaro cacti grow 3-4″ a year. How old do you think this cactus is? 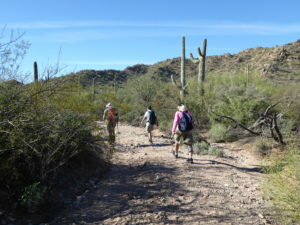 The hike took us through the desert and some washes. We could see the mountain ranges all around us. It was beautiful. If you look closely, you can see the trail. It was well marked at intersections and was easy to follow. We stopped for a lunch break at the Victoria Mine spur. This is the remnants of the old mine store. A bit of everything was mined here, copper, gold, silver and iron. There were several shafts that were covered with grates and some other buildings. 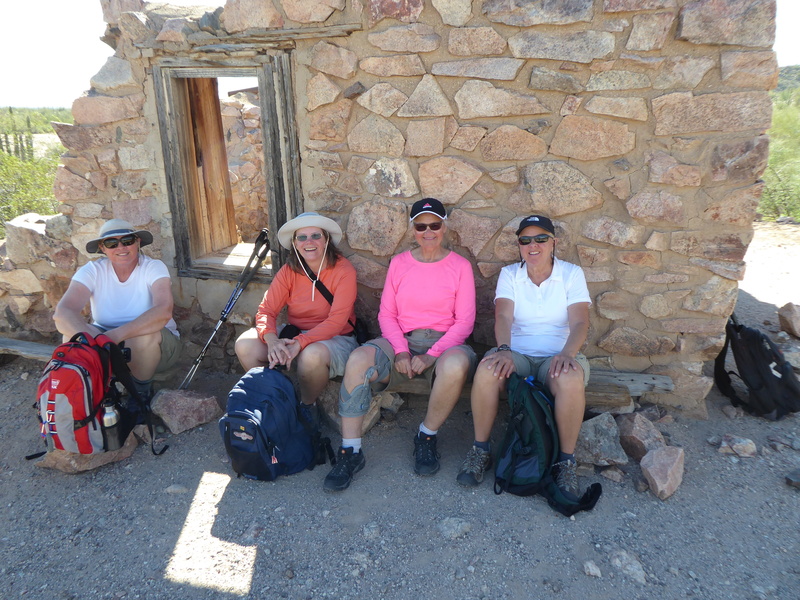 We were glad to find a bit of shade to enjoy our snacks and water. Four amigos enjoying a break. We took a van ride to go on the 21 mile scenic Ajo Mountain Drive. Ranger Scott was our guide on this trip and the entire RVing Women group almost filled the van. 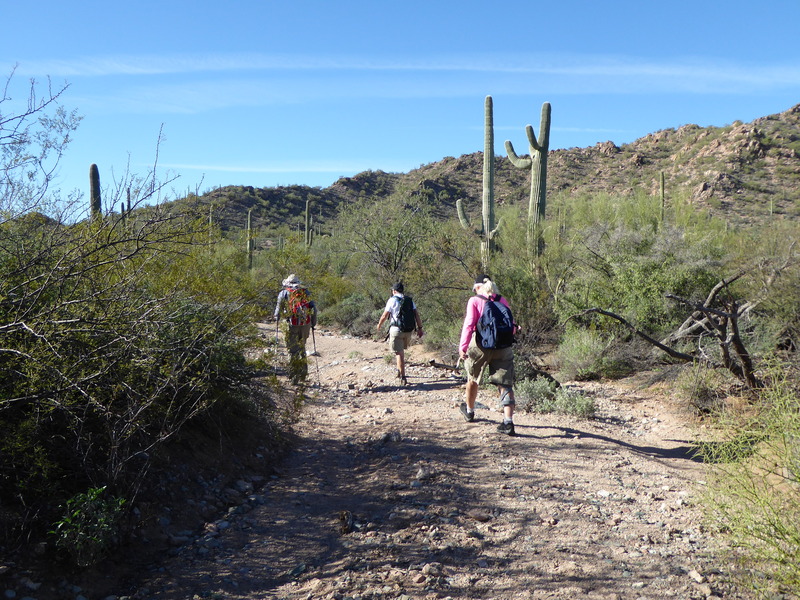 There were several stops along the way and we learned about several of the cactus species and shrubs. 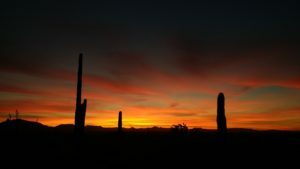 Cacti, like people are different and no two are alike. This Sagauro cactus has a growth anomaly called a Cristate. The Organ Pipe below is the oldest in the park and also is cristated if you look closely on the inside. It looks as if it is going to swallow us up! This is Arch Canyon. If you look closely, there is actually a second arch at the top that is fully closed as well. The trip was a 4 hour long journey with numerous stops and lots of questions. 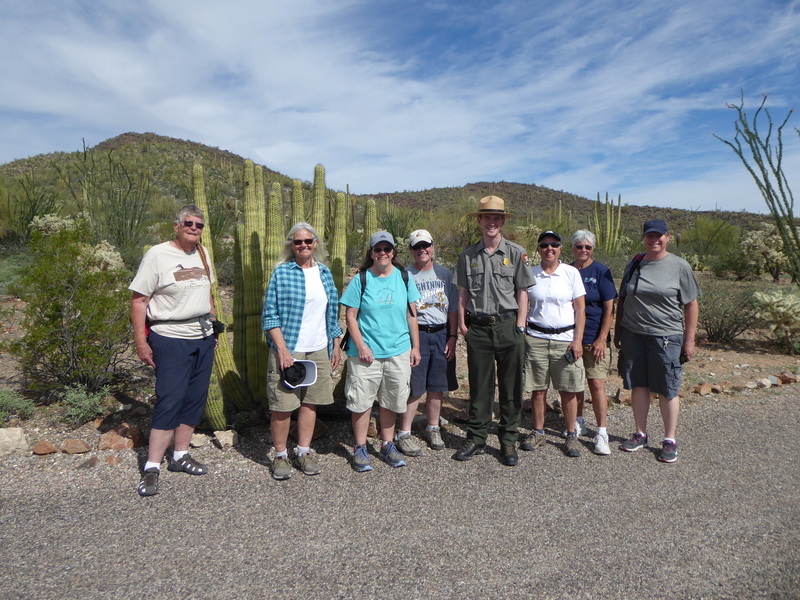 We learned a lot about the Organ Pipe National Monument. We had a fun time with Ranger Scott! 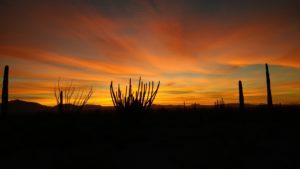 We took another ranger led hike and van ride south to Dos Lomitas ranch which is also on the Mexican border. This was another Gray brother ranch location and was the primary location. The adobe house here was much larger than the other two houses that we saw. The primary purpose of this hike was to find “farmers”. 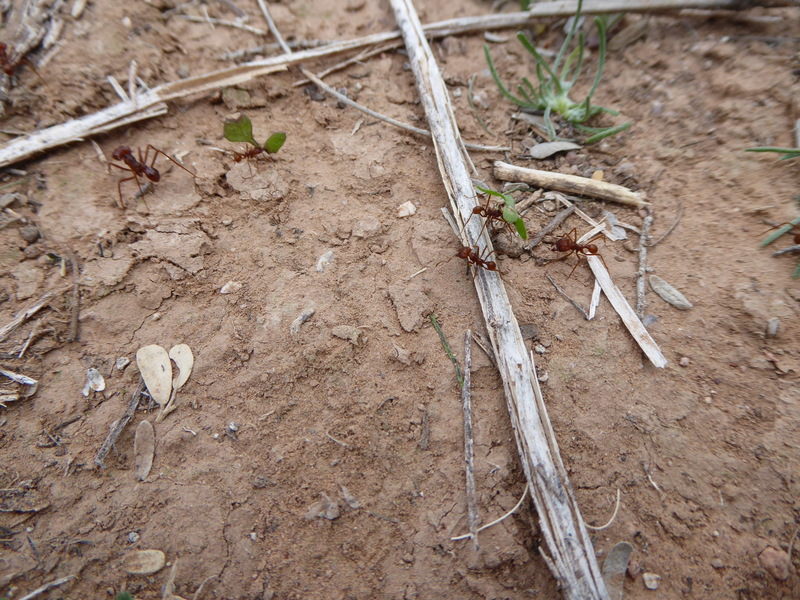 The ranger wanted us to find Mexican leaf cutter ants! They are another species who live in this desert. They leave traces and we were to find them by looking for paths in the sand. 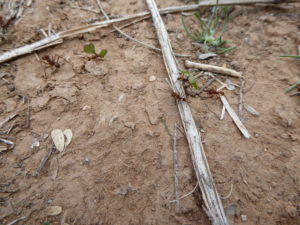 Mexican Leaf Cutter ants hard at work. There are ants of many sizes and jobs. 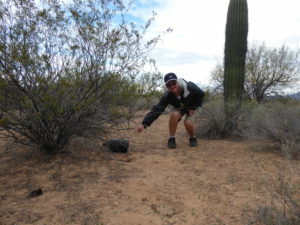 While walking around looking for ants, Kathy found a black water bottle. Black water bottles are used by smugglers who transport drugs so that the water bottles don’t give off a reflection at night. We certainly enjoyed all the hikes and the wonderful variety of views. 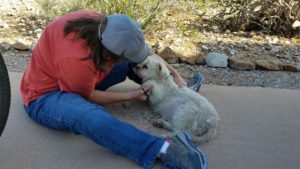 As much as we like the desert, it is hard on Heidi! She often picks up burrs and spines from the cacti in her hairy paws as we go for walks around the campground. This happens in unexpected places as well. We now carry a cacti removal kit with us which includes a fine tooth comb, a larger comb and some tweezers. 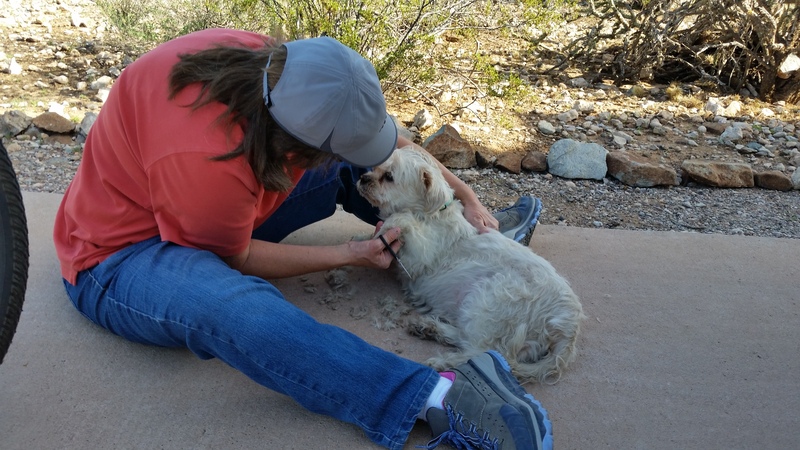 In order to help alleviate the problem, Linda trimmed Heidi’s feet. Like most dogs, Heidi doesn’t like her feet touched much. She has seemed to learn now though, when she steps on a sharp object, she just stands still and waits for us to comb out the thorn. It does seem to bother her though as she licks the foot for some time afterwards. 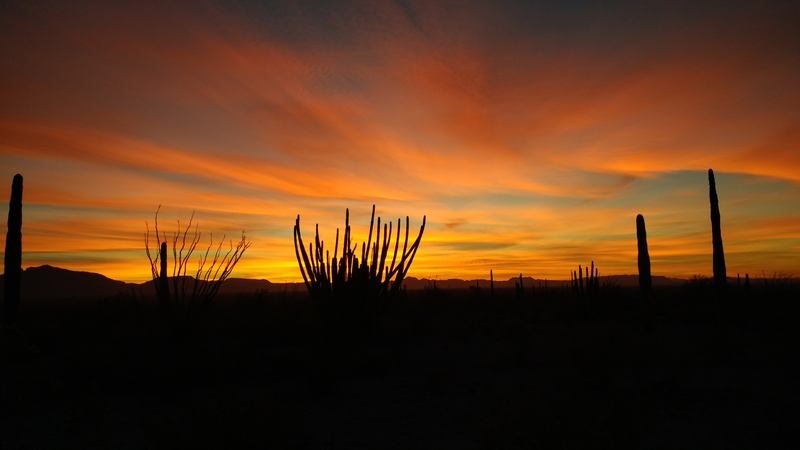 We leave you with a couple more sunsets. 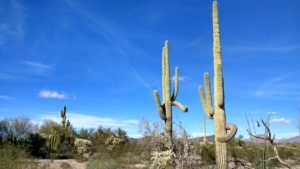 Organ Pipe National Monument is a gem and we truly enjoyed it. 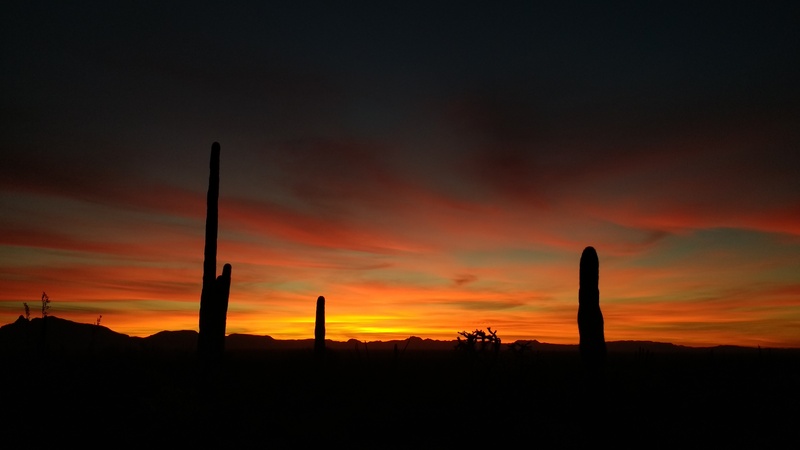 This entry was posted in Arizona and tagged Mexican Border, Organ Pipe National Monument. Bookmark the permalink. Holy Crap…what a great blog….again…and beautiful pictures!!!! Thanks for your hard work capturing, editing and sharing those special times. Linda, Amazing blog, it is awesome you and Kathy are keeping it updated for everyone to see. The pictures are beyond beautiful, and can’t wait to see more! 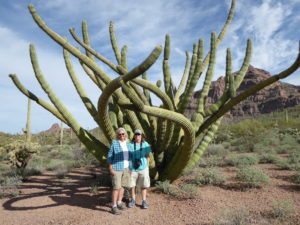 I am envious of your trip, but so glad you two are enjoying yourselves! Also looks like you found a good group of ladies to hike with! It looks like you are enjoying every minute of it! Be safe, and happy traveling!